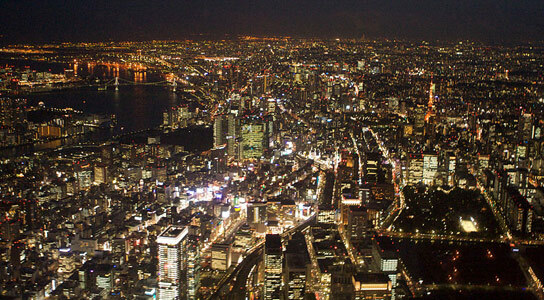 Tokyo is the world’s biggest megacity at a population of over 35,000,000. Image via Wikipedia. Megacities are usually defined by a total population in excess of 10 million, with an additional component of population density. Rapid urbanization will take a heavy toll on the infrastructure of local governments, if city planners don’t incorporate ways to tackle air pollution. This was stated in a new report from the World Meteorological Organization (WMO), in Geneva, Switzerland, and the International Global Atmospheric Chemistry (IGAC) project in Boulder, Colorado. Guangzhou is the second megacity in the world, with a population in excess of 25,000,000 but with an annual growth rate of 4%, which is 6 times the rate of Tokyo. Image via Wikipedia. There has been a rapid rise in megacities in developing countries. There are currently 23 megacities in the world. Sixty years ago, there were just 2. Half of the population of the world currently dwells in a megacity, and the urban population is expected to double by 2050, which could mean that 70% of the population would live in a megacity. Most of this growth will take place in the developing world. Megacities tend to have better job and education opportunities, and if they have many well-planned, dense populated areas, they could reduce land conversion and use energy more efficiently. However, many of the cities in developing countries are expanding with poor planning and few pollution-reducing measures. More than half of the world’s most polluted cities can be found in Asia, and air pollution contributes to the death of half a million people each year in that region. More than two-thirds of Asian cities, compared to one-fifth in the rest of the world, fail to meet the European Union’s air quality standard for particulate pollutants. One of the main reasons of this is the pace of development. The urban population in China has risen five-fold since 1950, skyrocketing energy consumption and putting millions more cars on the roads. In Beijing, the rising air pollutants are responsible for the rise in respiratory and heart diseases. Ground-level ozone concentrations have risen six-fold in the past 30 years, with the current levels at nearly twice the standard set by the US EPA. In Beijing, the concentrations of airborne particles 2.5 micrometers or less in diameter ranges between 100 and 150 micrograms per cubic meter, which is six to ten times higher than the EPA standard. One estimate indicates that mortality rates increase by 1% for every 10-microgram-per-cubic-meter increase of these particulates in big cities. China’s State Council introduced legislation that includes new air quality standards for Beijing, which should be on par with European megacities, and will be in place by 2016. Be the first to comment on "The Health Challenges of the Growing Class of Megacities"